Clinical Science Products, Inc. provides you the opportunity to take advantage of lots that are prepackaged and ready to ship. Clinical Science Products, Inc. provides you the opportunity to take advantage of lots that are packaged according to your bottling / dispensing requirements and guidelines. *For returning customers with large quantities we offer upon request the option to request a sample for evaluation in order to check on lot-to-lot consistency. 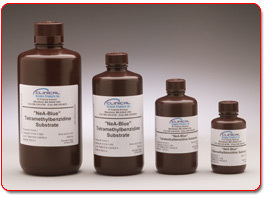 This allows you to check on precipitating TMB substrate performance before actual shipment. *Clinical Science Products, Inc. offers the opportunity to reserve a particular lot. In this way, you can request full or partial release of the bottled volume lot to your facility at your discretion. With this option, you will be taking advantage of price savings as well as bulk purchasing yet not making demands on storage until actually needed on site. Feel free to request a Free Sample for evaluation or request a price quotation with your requirements.